Black Beauty is one of the greatest classic horse books for horse lovers. It tells the story of a horse who goes through many difficulties in life...cruel owners, a fire, as well as kindness from others. It's such a beautiful book. What you may not know is that it was written 140 years ago! The author Anna Sewell was an invalid and it was the only novel she ever wrote. She died five months after it was published. Crippled from childhood, Anna loved horses and her book helped people understand how to be kind to these beautiful creatures. I can't think of any horse book that has been so popular since. Have you read Black Beauty? Please share your thoughts about it!! Black beauty is a book like no other. The book is about his journey. He goes through thick and thin, he's owned by cruel people, and owned by kind people. It is my fave book ever and I ALWAYS reread it. It's awesome. I have read this book in graphic novel and paperback. I can't get over how ginger was treated and the fact that she died. But I love the fact that Black Beauty got a good home in the end. Anyway, this book is for a little older viewers because of Ginger dying but other that that its pretty good. Whoever is reading this you should get the graphic novel version of this book. Anyway, I would definitely recommend this book. Black Beauty is a total must read! I love it! So great! I love that the main characters are the horses and not the humans! I love how the horses talk! Hey guys, what are you looking for when you look for horse fiction books? It is sad for a while while, he has bad homes. But it is such a cool story! This is the best book I have ever read. I have 3 or 4 copies, and I have read it at least 150 times in 5 years. This reminds me of my childhood! Awesome! Black Beauty is real or false? I decided to read this a lil bit ago. What a tear jerker! Me and my horse crazy friend right finished it in 3 days! Really good! The best but a bit sad. Awesome book - will steal any horse lover's heart. However heart breaking as well, could be too intense for young readers. It is a heartwarming story about a horse and his life as a foal until old age. The horse tells the story. It is a book that about everyone should read. I recommend this book. This was an incredible book. I love how the writer gets everything from Black Beauty's point of view. I absolutely LOVED this book! I loved it. I read it on my kindle and read it as much as I could until finished. Very exiting book. I am sad about Ginger though :( . I read the whole entire graphic one I finish it last week it was awesome, I am still sad that ginger died! If I ever and I mean it if I ever see some one mistreat there horse they'll not have a horse anymore cause I will report them and try to win the horse! Horses were made 2 help us and they want 2 help u! So be nice to them cause they want to be nice 2!!!!!! :0 ---> HORSES4EVER!!! that I ever read.T he real pain and real love and affection is shown in first two masters. Even though the last before master drinks he helps and feels kind. My dear black beauty when i will see you in my lifetime. bye. i love you! this book is my favorite book in the whole wide world but its kind of sad i have original from anne sewell it's a great book. It was so good, but really sad and heartbreaking. Everyone who loves horses should read this book!!!!!!!!!!!!!! I love this old classic! I've read the unabridged, the abridged, the graphic novel... etc. Black Beauty is such a great book! I don't like it when Ginger dies, I almost cried! But, otherwise a really really REALLY good book. I love black beauty so much but it's so sad when ginger dies. She's gorgeous ginger. BEST BOOK AND FILM EVER!!!!!!!!!!!!!!!!!!!!!!!!! This book is a great read for all the family, and those who are pony mad will love it. Heartwarming & touching - love it. Great classic book..... The only horse classic I know. A great read for all ages. Black beauty is one of the most saddest horse i have ever watched. it is amazing and i could watch it all the time. I'd luv to have him as a horse and ginger. Ginger is amazing, but i hate it when she dies. Whoever thinks this book and film isn't great then you need to sort it! I love black beauty It's the best book in the world you could ever have. I specially love Ginger but hate it when she dies. Black Beauty is a beautiful black horse that meets many other horses throughout his life. He is kind and gentle and just wants to be loved by his very own family. It's a book that will make you read it over and over again. It's a great choice for horse-crazy girls who loves to read! I love black beauty, it toutches my heart. black beauty is soooo beautiful!!! I love this book and movie. It's so sad though, what with Beauty and Ginger being abused and Ginger dying...I cry through most of it. I have your book and I love it. I hope you read my letter and have a good life. p.s I want a black horse. I love this book and have almost always been reading many books (in fact, I first read this when I was 7 and loved it!!!!) I have read it more than five times. This book is awesome! When i read it, i was very excited! story of this book is good, so read it. It's a very good book and is cool. I love it1! I just started reading the book and I love it already. I think the author describes everything brilliantly. I did a high school paper on this book and it's author. She did use many of her own life experiences to write it: such as locations, horses, and treatment of them. But on the whole, in her drive to abolish cruel treatment of horses, she over dramatized almost everything in the story. There were bad things that happened to Beauty than probably ever actually happened to any real horse in her time. Some where killed in there neglect and other things, but not all horses lived this "terrible" life. But it's still a wonderful story every animal lover should read. I LOVE Black Beauty. It's so interesting how misused horses were those days. It made me sad to think of all the horses that died because of misuse. Anna Sewell does a good job of showing you things through a horses prospective. This book is GREAT!! i really enjoyed the language this book was written in. It must be The best book written I'm not really sure who its wrote by because its not at my school library or at my house I'm still looking for it but I did once have the book my sister bought it at the book fair. I love this heartwarming story. It's a story for everyone to enjoy!!! it is a very sad book about a beautiful horse named beauty. it has a happy ending and i love it!!!!!!!!!!!!!!!!!!!! THIS IS THE BEST BOOK I HAVE EVER READ. THIS IS A BOOK ABOUT A HORSE.THE STORIES IN THIS BOOK IS WONDERFUL.THANK YOU ANNA SWELL FOR SUCH A BEAUTIFUL BOOK.I WANT MORE BOOKS LIKE THIS. 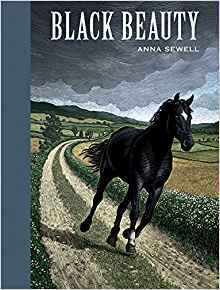 Black Beauty, by Anna Sewell, is the story of a horse who has race horse in his blood. Even though he's part race horse, he's sold to Governor Gordon to be a carriage horse. At first, he thinks he'll NEVER like his new home, but he then has a very close relationship with John the stableboy. When Mrs. Gordon becomes ill, Beauty is sold to a man to be a milk horse. At his new home, he's called "Black Jack" by the man's children. He then gets sold AGAIN to his original home with his mother, Duchess, & her owner. The story is told through the mind of Beauty & is a classic horse book. If you love horses you'll love Black Beauty!!!! This is a classic story written by Anna Sewell in her 50's while she was housebound. It is from the view of Black Beauty and starts with his very first memory and follows him through frightening, sorrowful and joyful moments all through his life until he reaches his final destination. It was written when horses were very ill treated and was meant to increase peoples' awareness of these creatures. It is very well written and exciting and, my personal opinion, captures the views of the world from a horse's eyes quite perfectly. Note from Syd's mom: I don't know who wrote this review, but it's beautiful! Good job! My Black Beauty book has four parts and forty-nine chapters. It is about a horse that gets taken to several homes meets several horses. And meets several owners. Black Beauty is a gentle stallion with good discipline. But his life is NOT going to be easy. He will endure the meanest and cruelest before it gets better as he travels to different homes and experiences the nice, and the mean. This book teaches us about what troubles a horse has as it takes you through the life of a gentle horse called Black Beauty. The cruel things and the sad and tragic things that come with every chapter will make you not want to put the book down; and toward the end you will wonder... will it have a happy ending? Black Beauty is a BRILLIANT book. It is about a yearling who was born at a beautiful farm and then gets sold so many times in his life. He had kind,caring owners and mean,brutal owners. It is set in London in the eighteen hundreds and is a must for any horse crazy kid.